Topic related to Valentine’s day, many enthusiastic photographers captured the moods of valentine. Most of the images are just a direct couple shots and the meaning of valentine here is confined only to couples..!. But still, few of the images deserve appreciation. 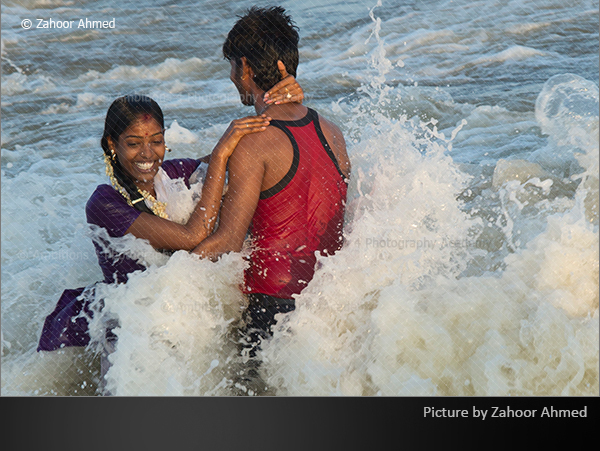 This image by Zahoor Ahmed is a beautiful peace of story telling picture about our Valentines. On the beach.., on a sunny day…, unmindful about the surroundings…., an interesting capture. The composition and exposure are just perfect. The man next to the couple talking on the mobile phone is an interesting element in the shot. The use of selective focus to establish an activity amidst the crowd is to be appreciated. 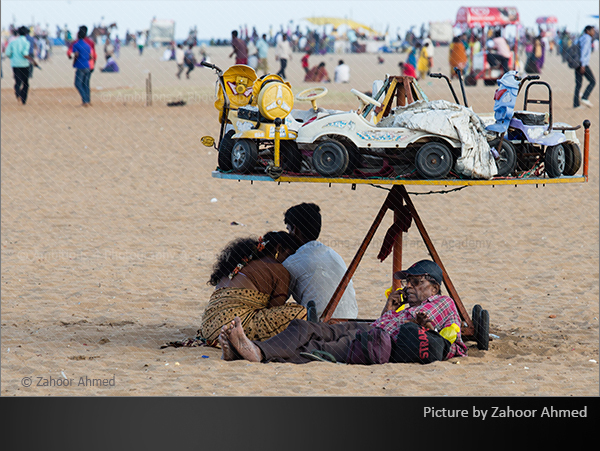 Another image (02) by Zahoor Ahamed is again in the beach. But is very expressive and depict the joy of togetherness. The splash of water and the mood is well captured. The light on the couple is just right and tells a lot about the details. A bit of a tilt in the frame could have added more dynamics and action. The above image by Arul Kumar is an unusual point of perspective. The translucent saree in the front does an appetizing job in the image. Though a set up shot, the feel of romance is established. Flow of the light and the fall of the fabric makes the image it interesting. The strong backlighting made the shot very effective. The shape of the couple is beautifully feathered with the soft backlight.